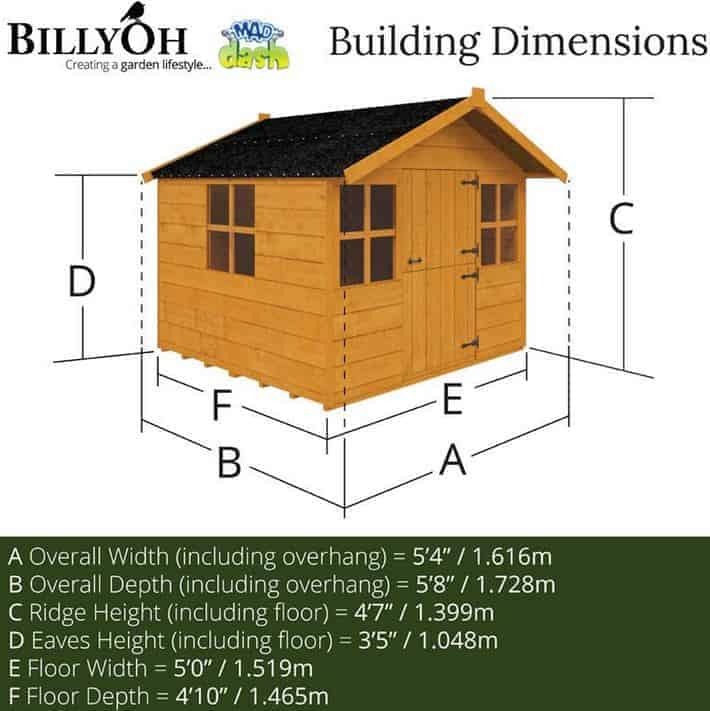 Wow – give your child their very own house and garden to enjoy! 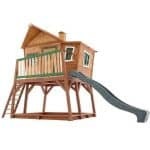 This traditionally styled playhouse will give your child many hours of imaginative play. A spacious interior and picket fenced garden for them to personalise and make their own. 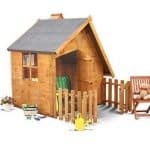 This is a sensational style playhouse which is constructed from wood so it is long lasting and hard wearing. 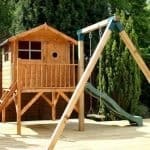 Children will love playing in and outside of the playhouse and it looks super no matter what garden you put it in. Design is such that it has pretty windows and a stable door it’s such a fantastic playhouse perfect for role playing. The house can be painted and decorated to your own specification as well. Let your children’s imagination run riot! We do not recommend this for under 36 months. Finally, there is no doubt that this is a great value playhouse. 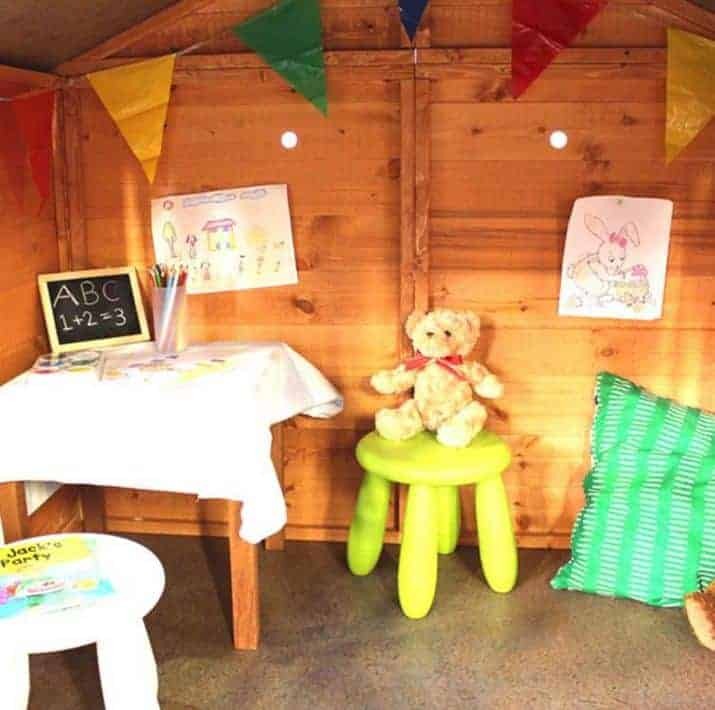 Suitable for both boys and girls, your child has the option of painting the wooden exterior to suit their particular tastes – the perfectly pink house for teddies and tea parties or the boyish blue to make a perfect den for them and their friends. This is a playhouse that will be enjoyed for many years to come by the whole family. The Mad Dash Wooden Playhouse Lollipop Junior: How safe is it? 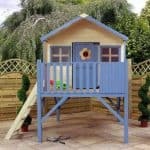 At whatshed.co.uk we understand that one of parents and carers main priorities when buying a new playhouse is safety. You want to be reassured that the playhouse is safe for purpose and to be given peace of mind that your child will be safe to play by themselves whilst you keep a watchful eye on them from afar. Below we take a look at the lollipop junior’s features and any aspects that may cause concern amongst parents and carers. 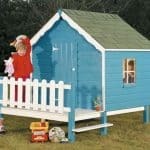 Playhouse: The playhouse itself has a spacious 6x5ft interior making it fantastic for your child and their toys. Child-sized furniture and decoration can be added to give it a more personalised feel. 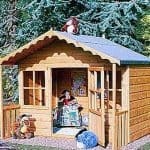 The playhouse structure is sturdy and weather resistant, meaning it can be used all year round as a garden hideaway. Windows and doors: The four windows and single door provide a light-filled and airy interior. The windows are glazed but as they cannot be opened in any way they do not pose an issue for small fingers becoming trapped. The lightweight stable door is a fantastic feature, however extra care must be taken, particularly with the two separate openings that small fingers do not become trapped. Picket fence: The picket-fenced garden area is a wonderful extension to the living space already provided by the playhouse itself. The picket fence is rounded with no sharp edges for safe play at all times. 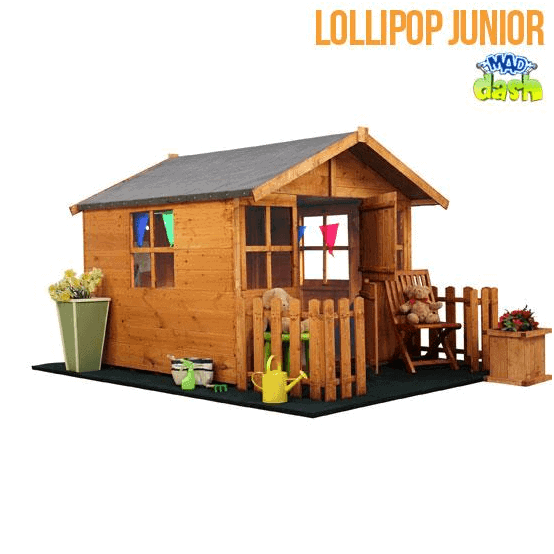 The Mad Dash Wooden Playhouse Lollipop Junior: How easy to build? The lollipop junior playhouse can be easily put together by even the most novice of DIY hands. Due to the smaller size and height of the building it would be possible for an individual to put this together, however for safety reasons or if you have an impatient child on your hands, it is recommended that a team of two people work on assembly together. All parts, fixtures and fittings will be provided. A basic tool kit for assembly can be purchased separately or you can of course use your own tools. You will be provided with a set of detailed instructions and easy-to-follow diagrams to keep you on the right track during the assembly process. The Mad Dash Wooden Playhouse Lollipop Junior: What is the overall quality like? Mad Dash makes children’s dreams come true with their fantastical range of imaginative playhouses, both traditionally styled and uniquely styled. With hard wearing, long lasting timber and a solid structure that will still be standing in your garden for many years to come, Mad Dash have thought of everything when it comes to the Bunny playhouse. Treated with a finish that will protect and give the playhouse longevity, ensuring that the colour will not fade, peel or chip. Designed to be as low maintenance as possible so your child can spend more time playing and less time waiting around, if you need to clean your playhouse to maintain its smart appearance, simply hose down or sponge clean with water. Children aged between 3-7 years will absolutely adore the lollipop junior playhouse from Mad Dash. 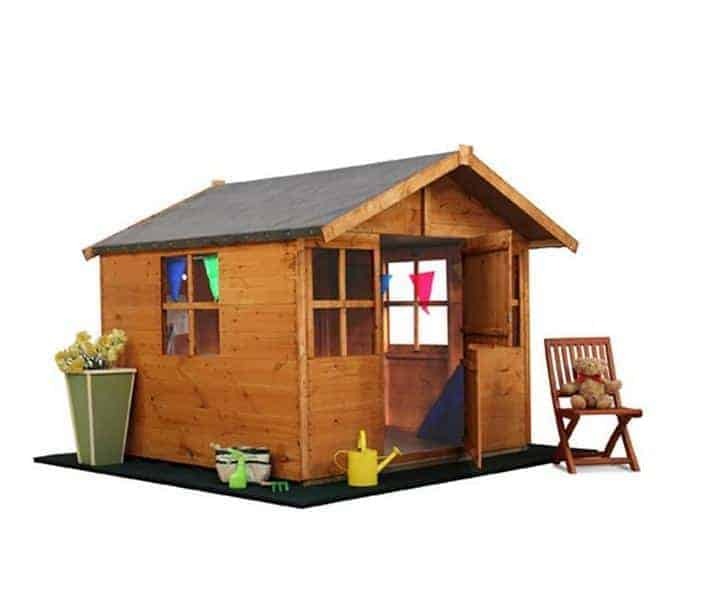 The complete package with both a playhouse and a picket-fenced garden area will allow for many games of playing house or simply creating a garden hideaway to share with toys and friends. At this superb price you are getting a lot for your money – a home away from home for your child that will be enjoyed for endless hours of fun. I just became the favorite aunt among my 3 nieces! I got them this playhouse for their summer vacation and they were like on the top of the world. 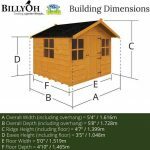 I did do some research work on playhouses and found this one to be the most satisfactory, regarding both quality and price. As it is made of wood, I have no worry about its longevity. Plus, this one is a very good buy for the money. It seems strong; it’s very easy to set up and it’s spacious enough for all my nieces to play inside the house. The only extra work you need to do is to color it up. But you can keep it the way it is in your garden as it looks quite well in its natural color. So who wants to be the best aunt or uncle? !